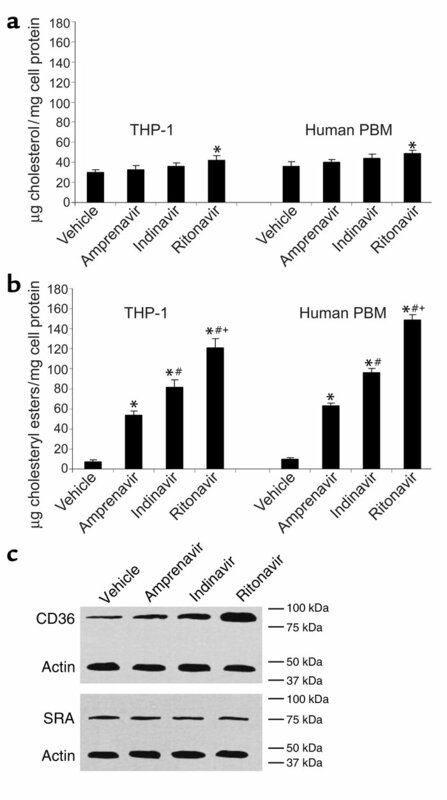 HIV protease inhibitors induce the accumulation of cholesteryl ester in THP-1 macrophages and human PBMCs. The human monocyte/macrophage cell line, THP-1, was cultured in 100 nM PMA for 72 hours to promote attachment and differentiation of the cells to a macrophage phenotype. In addition, we used freshly isolated and cultured human PBMCs (37) in these studies. The cells were incubated in the presence of 10% serum and 50 μg/ml of aggregated LDL along with 30 ng/ml of amprenavir, indinavir, ritonavir, or vehicle (ethanol) for 24 hours. The cells were lysed, lipids extracted, and processed to quantify total cellular cholesterol (a) or total cellular cholesteryl ester (b) by gas chromatography. Bars represent mean ± SE, n = 4 with triplicate measurements. *P < 0.01 compared with vehicle, #P < 0.01 compared with amprenavir, +P < 0.01 compared with indinavir. (c) THP-1 cells were lysed and 20 μg of protein was resolved by SDS-PAGE and immunoblotted with antibodies for CD36, SRA, and actin. Cross-reactive material was visualized by chemiluminescence. The exposure time was 2 minutes. The data are representative of five independent experiments. Essentially identical immunoblots were generated with human PBMCs (data not shown).